4.2% abv - in cans. Blik gekocht en gedronken tijdens vakantie in Frankrijk. Goudgeel helder bier met matig schuim. Aroma en smaak is hoppig en hooiachtig. Nasmaak is iets bitter. Smaakt voor mij als een "vakantie bier. 50 cl. can. A clear golden coloured beer with a white head. Aroma and flavour of malt, grain, hops, straw and with a bitter finish. Can courtesy of a homeless guy in Strassbourg, shared by Maakun at Les Thons. Clear golden with white head. Sweet malts, plastic, glue, cardboard. Sweet and light bitter. Medium body, malty and soft carbonation. Can shared thanks to my lovely girlfriend. Clear golden with fluffy white head. Some cardboard, corn, paper, light puke and marzipan. Light sweet and bitter. Light bodied. Disgusting. This is possibly the worst beer I ever drink. No taste, no head, no class. It maybe the cheapest one around, but it surely is not the best price/quality tag around. Just like World War II: NEVER, EVER, NEVER AGAIN. DISAPPROVED BY TAVERNY’S BLACK METAL CREW ! 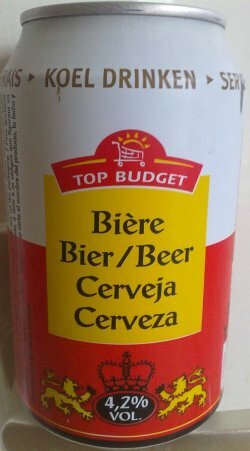 Half liter can - LOL @ the "bière" label. Nose is grainy corn. Harsh for 4%. Metal finish. Sessionable for a budget. Watery. Possibly worse than I expected as it was not that painful to drink, if that makes any sense. Jeftina piva. Zlatno žute boje, malo pjene i skoro ništa hmelja. Vrlo slaba i vodenasta. Običan lager za mase.